This is good. Their blue sea and white beaches are stunning. Bernadette, you are so right. I love Greece in many ways and the colours are quite spectacular. Blue and white seem to be the most favourite for their homes with bright reds in hanging baskets and climbing flowers. Great photo. I love the blue and white… I also love the bright colours a Facebook friend sent back from South America. I think our mood and spirits can be lifted by our surroundings. Grey concrete buildings should be banned. I have always loved blue and white, even more so now that I have Greek grandchildren. Do they live in Greece? What a wonderful place to go to visit grandchildren. No. They are Greek American. Their other grandparents were immigrants. The culture is still very strong and they both have Greek names. What a beautiful shot of a heavenly place … quite literally a happy snappy! You crack me up – happy snappy. I definitely am stealing that phrase. Bernadette, I love this photograph and the wonderful blues of the sky, the staircase and doors contrasting with the gleaming white … a picture postcard image! Now, isn’t it tempting to pop by the stall and try on some hats!? It was and I did. It was beautiful there, that I kept wanting to pinch myself to make sure I wasn’t dreaming. Annika, that is exactly what I did after I took the shot. Have a wonderful week. 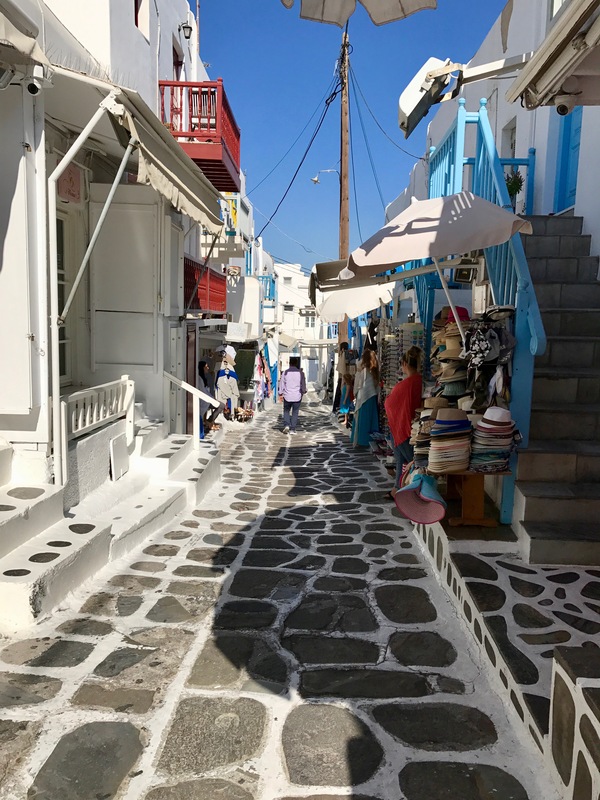 I am a blue & white girl so I have always thought the photos of the Greek Isles were amazing…lovely photo Bernadette…I like the way you captured the everyday living aspect. Thank you so much my friend for the encouragement. Greece is on my bucket list, and your post just moved it up a notch or two! Margo, you and your camera would be in heaven. Hi Diana, I can only imagine what the beauty of the Greek Islands would inspire you to write. 😀 We’re close to retirement, Bernadette. And blogging has made me want to travel the world. Great photo, you’ve captured Greece in a nut shell! Incredible – I could sink myself into this scene. You are a great photographer. This beautiful shot makes me want to wander down that lane.